R-Studio and R-Studio Agent can be connected over the Internet. The connection can be made either using IP addresses or DNS names. If either (or both) of the hosts are on private networks behind NATs and firewalls and do not have public IP addresses, the corresponding ports should be opened or forwarded. In addition, connection should be made either only from R-Studio or from R-Studio Agent . * Both R-Studio and R-Studio Agent have public IP addresses (no NAT/firewall) or the ports on the NAT/firewall are forwarded/opened. A connection can be made either from R-Studio or from R-Studio Agent . * R-Studio is behind a NAT and R-Studio Agent has a public IP address or the ports on its NAT/firewall are forwarded/opened. A connection should be made from R-Studio . * R-Studio has a public IP address or the ports on its NAT/firewall are forwarded/opened and R-Studio Agent is behind a NAT. A connection should be made from R-Studio Agent . * Both R-Studio and R-Studio Agent are behind NATs/firewalls. If a connection is to be made from R-Studio Agent to R-Studio , R-Studio should be set to accept connection on the Connect to Remote Computer dialog box . 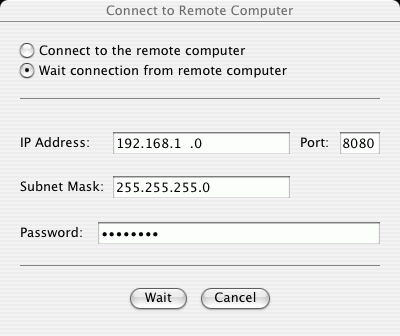 Select Wait connection from remote computer , and specify options for incoming connections. Enter a password to obtain access to this computer from a network. specifies addresses from which this computer can be accessed. specifies subnet mask of the network from which this computer can be accessed. R-Studio will wait for an incoming connection. Connecting from R-Studio Agent to R-Studio. (See the R-Studio Agent for Mac or R-Studio Agent for Linux help page to learn how to establish connections from those R-Studio Agent versions). 1 Select Connect to on the Tools menu. 2 Enter the necessary information on the Connect to R-Studio dialog box and click the Connect button. Specify the DNS name or IP address of the host where R-Studio is running. Specify the port set on the R-Studio Connect to Remote Computer dialog box. Specify the password set on the R-Studio Connect to Remote Computer dialog box. > R-Studio Agent will connect to the computer where R-Studio is running and it will show the hard drive and logical disk structure of the remote computer.